Qian Hongyan suffered horrific injuries in a car crash when she was three years old in 2000 and doctors had to amputate her legs to ensure her survival. Hongyan’s family in Zhuangxia, China wasn’t wealthy enough to provide her with hi-tech equipment to help her walk, so they gave her half a basketball to help her move. Hongyan used brushes as low-level crutches. 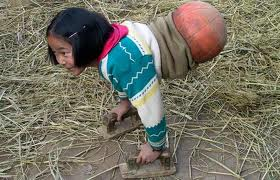 The handicapped Chinese girl Qian Hongyan used to crawl with two home-made props and part of a basketball at Zhuangxia Village in Luliang County of Qujing City, Yunnan Province, China She was able to travel to and from home and school by bouncing on the basketball. She struggled for five years like this. The girl’s story was widely reported in the media and experts from China Rehabilitation Research Center decided to help her for rehabilitative treatment during early 2005.Qian now has a pair of proper prosthetic legs, but still says she likes to use the basketball from time to time as it is easier for her to get in and out of the pool with. When the seventh national special sports-meeting was held in Kunming in May 2007, Qian Hongyan went to watch the games every day and seeing the handicapped players struggle in the matches deeply moved her. Qian Hongyan was naturally worried about floating when she tried swimming for the first time. But Qian Hongyan was determined to join in the special swimming club. She and her parents went to consult the opportunity with Zhang Honghu, a well known coach who has trained many handicapped swimming champions. Then, QianHongyan began her life in the swimming club and did professional swimming training. At first, Zhang didn’t pay much attention to Qian Hongyan. “The individual’s capability is important in choosing a player,” he said. “Qian Hongyan doesn’t have legs. It seems that if a ship has no helm, then the ship could not work well for lack of a sense of direction.” In order to solve the problem, Zhang made a special training plan for Qian Hongyan to help balance the shoulders.She always does the exercises and sit-ups, dumbbells and so on carefully. Qian Hongyan swims for about 2000 metres in a day. “I had to give much more than other kids when I learned to swim,” Qian said. “It seemed there was no way I could float in the water. I was choked.” It took her several weeks to get used to the water, but once she did Qian discovered she has a real talent for swimming. “It’s so free and relaxing to swim,”"You can go anywhere you want and it is much freer than on the ground.” she said. “Qian Hongyan studies hard. She never grouches in training although she was confronted with many difficulties at the beginning, ” her coach said. After a short period, to Zhang’s surprise, he found that Hongyan was gifted in swimming. Zhang said, “I couldn’t ensure she would be a world champion. However, I can tell that she is definitely a promising swimmer. Our biggest wish is to train her to have a positive attitude to life.” Qian Hongyan’s dream is to become a world champion. She works hard to achieve her dream. Now 18 years old, she returned to the China Rehabilitation Centre in Beijing for her adult prosthetics. She touched the hearts of millions of people around the world and is fondly referred to as the ” Basketball Girl”. Qian Hongyan though differently abled has big dreams. The accident may have robbed her of her legs but certainly not her spirit. She has plenty of courage and determination and is indeed a great inspiration to all the differently abled people around the globe. Watch this video to know about her success story. This entry was posted in Uncategorized and tagged China's Basketball Girl - Qian Hongyan, Hongyan, ian Hongyan, Qian. Bookmark the permalink.